Bid committees for the 2024 Olympic and Paralympic Games have sent official delegations back to Rio to experience the Paralympic Games that have opened Wednesday at Maracanã Stadium in Brazil. The International Olympic Committee (IOC) and International Paralympic Committee (IPC) have allowed bid committees special access to the Games as part of the official observer’s program that began last month during the Olympics. 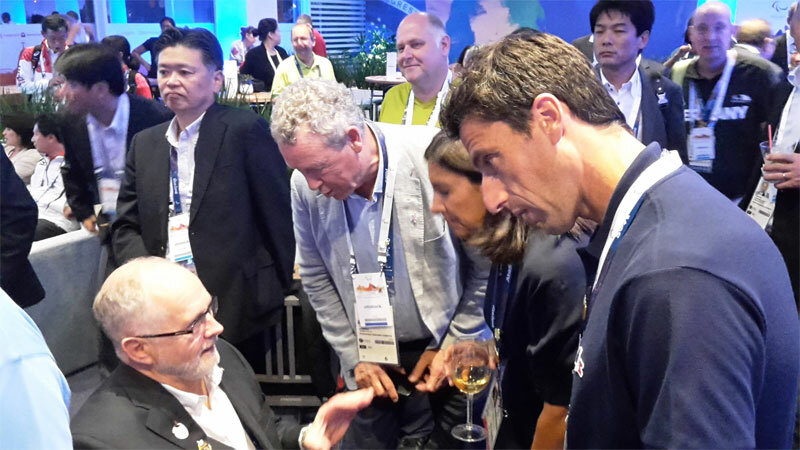 The Paris 2024 delegation in Rio says it expects to learn and gain valuable insight from the IPC and the Rio 2016 Organizing Committee. The team is led by bid co-chair and International Olympic Committee (IOC) member Tony Estanguet, co-chair Bernard Lapasset and includes Paris Mayor Anne Hidalgo. “After a successful Olympic Games I’m delighted to be back in Rio to cheer on the athletes and I look forward to meeting with members from the Paralympic family during my visit”. The LA 2024 Candidature Committee are fielding a 16-strong bid team led by Chairman Casey Wasserman, CEO Gene Sykes, Vice Chair and 12-time Paralympic medalist Candace Cable and IOC Executive Board Member and LA 2024 Senior Advisor for Legacy Anita DeFrantz. The team hopes to gain a greater understanding of how best the United States and Los Angeles can serve the needs and priorities of the Paralympic Movement. The team will be joined in Rio by Steve Simon, Executive Director of the City of Los Angeles Department on Disability, and Clayton Frech, CEO and President of Angel City Sports, organizers of the West coast’s largest celebration of adaptive sport, the Angel City Games. United States Olympic Committee Chairman Larry Probst and CEO Scott Blackmun will also represent the LA 2024 bid committee in Rio and will be joined by numerous LA 2024 team members. The run up to the Rio 2016 Paralympics has been troublesome as it has shared in some of the caveats of the Olympic Games including the Zika virus scare, fears over street crime and shoddy facilities in the Olympic and Media Villages. Additionally, initially low ticket sales and severe budget cuts that caused the elimination of an entire venue cluster have caused great challenges for the Games. Clearly, the bids will want to learn and capitalize on the opportunity to improve the model should they earn the right to host the Games. On Thursday the Italian Olympic Committee (CONI) hosted a discussion at Italy House regarding Paralympic Games legacy. In attendance were Rome 2024 Vice President Luca Pancalli, along with the Bid Committee’s general coordinator, Diana Bianchedi and the head of international relations, Simone Perillo. Meanwhile in Rome embattled anti-Olympics mayor Virginia Raggi has planned a meeting with CONI President Giovanni Malagò after the Rio Games to discuss the future of the Rome 2024 Olympic bid. It’s likely that she’ll cancel the bid in order to focus spending on more critical city projects. The Paralympic Games close on September 18.